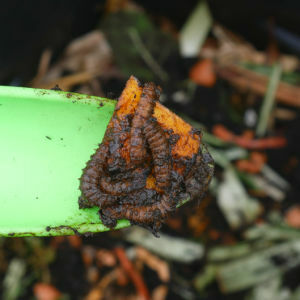 Brown Larvae In Compost? What You Need To Know - Family Garden Life. I’m guessing you’re reading this because you have brown larvae in compost? You’ll be happy to know that this isn’t a bad thing. In fact, it’s something new to learn and embrace in your food garden. I remember the first time I saw these larvae wriggling around and all I could think of was ‘maggots’. Maggots don’t have the best reputation because they are associated with stinky garbage and the summer heat. Both of which are very true. Hopefully, when you’ve finished reading this article, you’ll have a different appreciation for these compost dwellers. 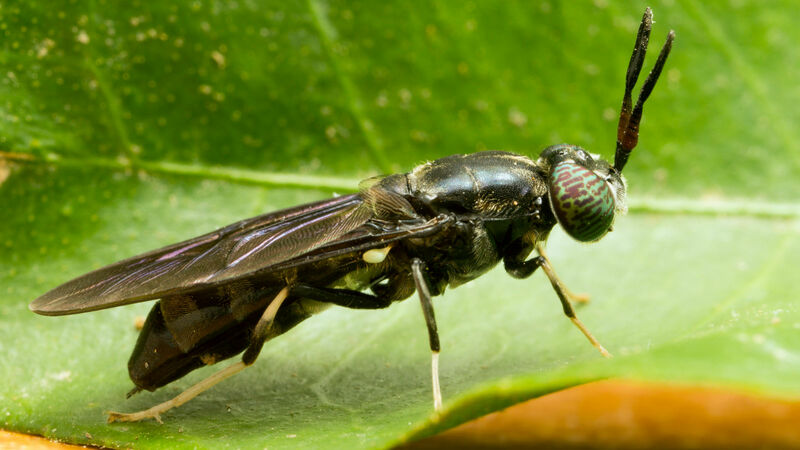 You mightn’t have recognised the black soldier fly in your garden because it doesn’t look like your regular big eye’ed, round-bodied housefly. It’s got a longer body resembling more of a wasp shape. Unlike most annoying houseflies, they don’t buzz around our faces or our food because they aren’t the best flyers. Instead, they spend most of their time focused on compost piles and manure deposits. You’ll be happy to know they can’t bite us either because they don’t have mouths. The best thing is that houseflies tend to steer clear of breeding areas because they dominate the area by reducing what houseflies need to flourish. They also don’t like how the larvae turn the decaying matter into a liquid form which isn’t as inviting to lay eggs. Black soldier flies love a moist, steamy, humid, pile of moosh. This is when you’ll find them eyeing off your compost as their next nursery. 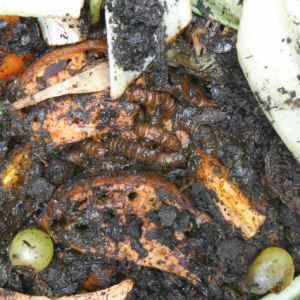 The larvae of the black soldier fly are compost machines. Once they hatch they start churning through the moist rotting food in your compost, especially if it’s sitting at the top of your pile. Unlike the black soldier fly, the larvae have mouths so you’ll soon see how useful they are at breaking down decaying matter. Worms actually prefer the liquid-form they leave behind as it’s easy for them to digest. Whilst these amazing composters are a benefit to your outdoor compost, you don’t want them to completely take over. Worms and black soldier fly larvae can live in harmony, as long they don’t compete. You’ll find the larvae at the top of your pile feasting on moist rotting materials. Your worms will be happy working through the rest of your pile, so keep an eye on the balance. If your larvae are taking over, simply revert back to your composting 101 basics where you add more carbon to dry out your mix. Worms are very happy with a balanced system. So by adding in shredded newspaper, cardboard, dry leaves etc, will make your worms happy and your compost less attractive to the black soldier fly. You can also bury your kitchen scraps deeper and cover them with soil or cardboard to mask the scent that attracts the fly. 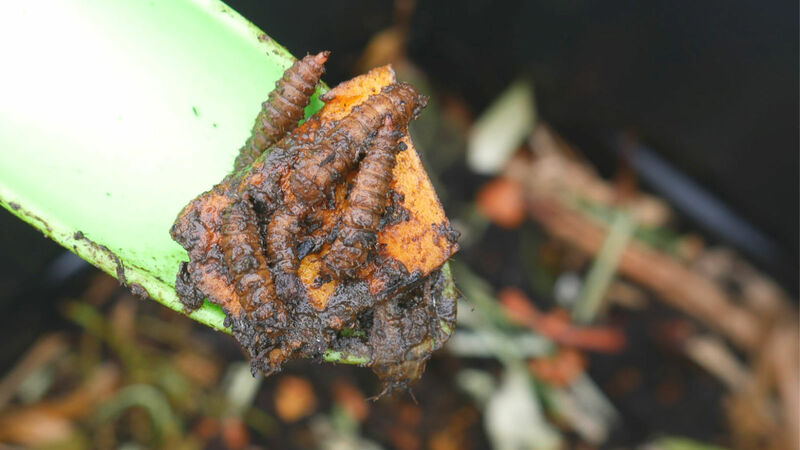 Whilst the larvae of the black soldier fly should be embraced in an outdoor compost, having them in a worm farm is a different story. If the brown larvae start appearing in your farm then you need to remove them and change your balance. If the larvae move in, the worms will eventually move out because they aren’t up for the competition. Remove all the moist rotten food first, and remove as many larvae as you can find. Then you want to add in your carbon materials like a worm mat, shredded newspaper, coco peat. Cover all of this with wet cardboard. This will help mask the smell. You’ll need to reduce the volume of wet ingredients, like your food scraps. Keep in mind worms love carbon ingredients so they will still have plenty to eat. When you do add food scraps, remember to bury it below the castings and bedding. Brown larvae in compost isn’t a bad thing. They are great composters and will benefit your outdoor composting system as long as you keep that balance right. Keep both the earthworms and your larvae happy and in balance because they are both doing an awesome job.